« Why should you consider Website Redesign? What are the benefits? Why does your website need a Website Redesign? What are the tell-tale signs? There’s an old dictum that says change is the only thing permanent in this world. This rings true even in cyberspace. Technology is constantly changing, and this is exemplified by advancements in the design of websites. 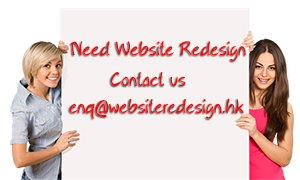 If you own a website which has not gone any cosmetic alteration in the past year or so, perhaps you might consider hiring the services of a pro website redesign company to look into your web redesign. In the past decade, websites were primarily accessed on a laptop or desktop computer. But these days, more people are going online using their smartphones and tablets. Thus websites need to be designed in such a way that they can be accessed on any device—from the desktop computers to mobile devices such as smartphones and tablet PCs. If your website cannot be easily viewed on all devices, then it’s high time that it undergoes a web redesign. By doing so, you can maximize its potential to attract as many visitors as possible. Do you remember the last time that you updated your website? If so, then perhaps the main reason why you haven’t made any updates to it is because you find it difficult to do so. In the past, website owners usually sent the content of their websites to a website developer, who in turn will be the one responsible for uploading the articles or photos. But today it is now possible for a website owner to update his or her website every now and then through the use of a content management system (or CMS). With a CMS, you can post new articles or upload a photo of a new product you’d like to sell on your website. You no longer have to pass these materials to another guy and wait for a day or so before you view the fresh material online. By redesigning your website with the use of a CMS, you can make your website fresh and thus more appealing to your target audience. Like an old house, there are parts of a website which become outdated over time. For instance, many websites no longer invite visitors to subscribe to their mailing list. Instead, online visitors are encouraged to follow a website on Twitter, or like a website’s Facebook page. By website redesign project, you can remove old functions and features which you deem to be irrelevant, and incorporate new ones that will make your website more attractive to your visitors.